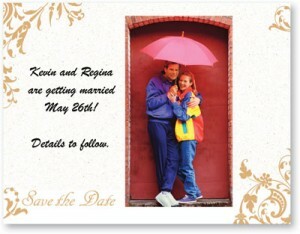 Everything you need to know about save the date events can be found right here on the PaperDirect blog. 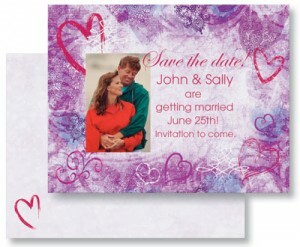 In addition to providing useful information about DIY (do-it-yourself) weddings and wedding etiquette, PaperDirect is also your one-stop online shopping source for DIY wedding necessities like wedding invitations, wedding reception cards, response cards, wedding thank you cards, and save the date magnets and save the date postcards. You might know all the ins and outs of sending wedding invitations, but save-the-date etiquette is sometimes not so clear cut. Save-the-date postcards or magnets are typically sent to your wedding guests six to eight months before the date of your ceremony so that they can mark it on their calendars. It’s okay to send your guests a wedding save-the-date by email, but don’t forget that this wedding card is really the first introduction your guests will have to your wedding, so a lot of couples thinking up unique ways to incorporate their wedding theme into their save the date reminder. If you are looking for a more traditional reminder, PaperDirect has save the date postcards and save the date magnets; it’s really just a matter of personal preference which you choose. Look at our selection of both and see which one best fits your personality and style of wedding. Creative Save the Date Ideas–Wedding Magnets!